ʻAhoʻeitu Tupou VI (Tongan: ‘Aho‘eitu ʻUnuakiʻotonga Tukuʻaho; born 12 July 1959) is the King of Tonga. He is the younger brother and successor of the late King George Tupou V. He was officially confirmed by his brother on 27 September 2006 as the heir presumptive to the Throne of Tonga, as his brother (a bachelor) had no legitimate children. He served as Tonga's High Commissioner to Australia, and resided in Canberra until the death of King George Tupou V on 18 March 2012, when ʻAhoʻeitu ʻUnuakiʻotonga Tukuʻaho became King of Tonga, with the regnal name ʻAhoʻeitu Tupou VI. He was born in Nukuʻalofa, Tonga, the third son and youngest child of King Tāufaʻāhau Tupou IV. He was educated at The Leys School, Cambridge, from 1973–77. He then attended the University of East Anglia, where he read Development Studies, from 1977 to 1980. He started his career in the military, joining the naval arm of the Tonga Defence Services in 1982 and becoming a Lieutenant-Commander in 1987. He graduated from the US Naval War College as part of Class 33 in 1988. From 1990 to 1995 he commanded the Pacific-class patrol boat VOEA Pangai and his time in charge included peacekeeping operations in Bougainville. He graduated with a masters in Defence Studies from the University of New South Wales in 1997 and with an MA in International Relations from Bond University in 1999. In 1998 he ended his military career to become part of the government, first as the defence minister and the foreign minister at the same time, from October 1998 until August 2004. He took over these posts from his elder brother Tupoutoʻa, at that time still the crown prince, later to become King Siaosi Tupou V (see below). Soon he was appointed as Prime Minister on 3 January 2000, a function he kept until his sudden resignation on 11 February 2006. Its reason has never been made clear, but was probably due to the unrest from a series of pro-democracy protests calling since mid-2005 for a lesser role for the royal family in government. His appointed successor, Feleti Sevele, was Tonga's first prime minister who was not a hereditary estate holder or a member of the 33 noble families that make up the Tongan aristocracy. In 2008 ʻAhoʻeitu was appointed Tonga's first High Commissioner to Australia, a post he held until his succession to the Tongan throne in 2012. In addition, he was also Ambassador to Japan from 15 January 2010 to his coronation in 2012. In 2013 he was appointed as Chancellor of the University of the South Pacific. She followed her father's steps to be the current High Commissioner to Australia since 22 August 2012. Prince Taufaʻahau Manumataongo – Taufaʻahau Manumataongo Tukuʻaho (born 10 May 2013 at Auckland City Hospital in Auckland). Princess Halaevalu Mata'aho (born 12 July 2014, Auckland City Hospital in Auckland). Prince Ata – Viliami ʻUnuaki-ʻo-Tonga Mumui Lalaka-Mo-e-ʻEiki Tukuʻaho (Nukuʻalofa, 27 April 1988). Since his confirmation as heir presumptive, he got the traditional title of Tupoutoʻa, reserved for crown princes, which his older brother (the second) had to give up because he married a commoner, while two of his previous titles went to his sons. As such he was until his accession to the throne known as Tupoutoʻa Lavaka. His elder son, Siaosi, (George) is to be addressed by the prestigious title of ʻUlukālala of Fangatongo, while his second son, Viliami, (William) was bestowed with ʻAta of Hihifo. King Tupou VI and Queen Nanasipau’u were crowned in a ceremony conducted at Centenary Church in Nuku'alofa on 4 July 2015 by Reverend D'Arcy Wood, a retired Uniting Church in Australia minister who was born in Tonga. He was assisted by Reverend Dr. ‘Ahio and Reverend Dr. Tevita Havea, the president and the secretary general of the Free Wesleyan Church of Tonga. The celebrations included many international invited guests, and an estimated 15,000 people, mostly expatriate Tongans, flew in to join the celebrations. During the ceremony, Tupou VI was anointed with holy oil, adorned with a ring, and presented with a scepter. The crown was then placed on his head by Wood, who performed the anointing and crowning as a matter of circumventing the taboo on native Tongans touching the King's head. The celebrations ran for a total of eleven days, beginning a week before the ceremony. It is customary in Tongan culture that princes get a traditional chiefly title, by which they then are commonly known. As such for many years, until his confirmation as Heir Presumptive, ʻAhoʻeitu was known by either one or all three of the titles which were bestowed on him over the time: Lavaka from Pea, ʻAta from Kolovai and ʻAtatā, and ʻUlukālala from Fangatongo. These titles may be used in any order, (the one belonging to the area from which the speaker is coming usually first). Nevertheless, the sequences Lavaka Ata ʻUlukālala and ʻUlukālala Lavaka Ata were most common. ^ "Announcement of the Passing of His Late Majesty & Proclamation of the New King". Tonga Government Portal. 21 March 2012. Archived from the original on 15 April 2012. Retrieved 21 March 2012. ^ "HRH The Crown Prince Tupouto'a Lavaka: Tonga's First High Commissioner to Australia". Tonga Government Portal. 16 August 2008. Archived from the original on 30 November 2011. Retrieved 20 March 2012. ^ Fonua, Pesi; Folau, Linny (4 July 2015). "HM King Tupou VI and Queen Nanasipau'u crowned at Centenary Church". Matangi Tonga. Vava'u Press. Retrieved 4 July 2015. ^ Fox, Liam (4 July 2015). 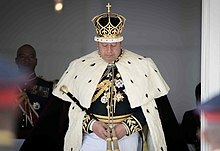 "Tonga crowns King Tupou VI in lavish public coronation, parties". Nuku'alofa: ABC News. Retrieved 4 July 2015. Wikimedia Commons has media related to Category:Tupou VI.